I love Indie June. Every year we have a fabulously exciting programme for you, celebrating independent design with a round up of tutorials, interviews and patterns galore. This year is all about new techniques, so we’re learning from the crème de la crème of the knitting world and Nikki Poulton, podcaster and knitter will be taking you through a new technique each week with some handy guides! First up, cable knitting. Whether you’re learning to cable cast-on for the first time, or looking for inspiration for your next project, grab a cup of tea and let Nikki guide you through her favorite tutorials and patterns, from simple cables to travelling, complex cables. She’ll also be chatting to the fabulous cabling maestro Gretha Mensen. If you’ve not discovered cabling, or even if you’re a cabling queen, you’re going to love the range of patterns we’ve got to show you! Welcome to the wonderful world of colourwork – it can be as simple as stripes, or as complex as Fair Isle or intarsia – but it’s fabulous fun, and we’ve got some delicious inspiration coming your way! Fiona Alice, the super talented designer from Nova Scotia, is a colour whizz, and her patterns will lead you through simple Fair Isle to the sweetest intarsia mitts. Nikki’s guide is coming Monday 11th June! 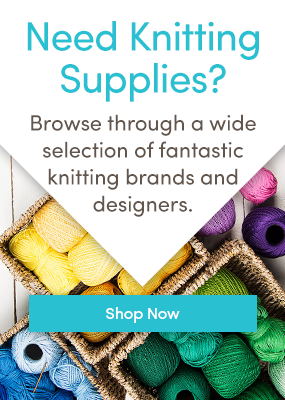 I Heart Handmade – Fair Isle mitts to start your colourwork journey! Short rows terrify knitters, but there’s no need to be scared of such a straight forward technique! Short rows are used to create shape – for example to bend a crescent shawl, or to create features in toys – or even just for decorative effect as you can see so beautifully below in the Toph hat. . There are several ways to knit short rows, from a simple wrap and turn, to a German or Japanese short row. Woolly Wormhead, doyenne of hat knits, is here to show you how it’s done! Nikki’s guide is coming Monday 18th June! Lace is often a source of consternation amongst knitters, some love it, some are frightened of it – but week four is all about demystifying lace! We’ll have patterns from the fabulous Ankestrick, and wonderful Stella Ackroyd, as well as helpful tutorials and information about how to manage your yarn overs, double yarn overs and other lace stitches! Nikki’s guide is coming Monday 25th June! Join us for a month of design celebration and technique tutorials! Last updated: June 8th, 2018. You sound like a lovely person Merion, with a diverse range of personal loves, some of which we share. Thank you for all this information and all your hard work in putting it together – much appreciated. Oops, sorry, she’s new to blogs!